In a burst of end of the year cheer British political philosopher John Gray wrote an article on the BBC about the myth of progress in light of the ongoing collapse of European institutions, if not of free-market capitalism altogether. I can see his point as far as puncturing simplistic, utopian tendencies – as if there could be a system of any kind that people wouldn’t be able to screw up – but some of the details of his argument strike me as a bit peculiar. He argues that post WWII stability in Europe is the exception rather than the norm, which is largely true in terms of military conflict but less so in terms of regular life. Yet the example he chooses to represent a more typical “discontinuity” is the life of Arthur Koestler, a restless, multilingual, ideologically and intellectually inquisitive wanderer who was so exceptional that it is impossible to think of him as reflecting ordinary European life at any time. “In Europe between the two world wars, it was the idea of gradual progress that was truly fantastic. Recognizing and acting on this fact, sometimes at the risk of his life, Koestler was for all his faults a heroic figure,” Gray writes. By this logic, of course, the Nazi and Fascist enemies of gradual progress on the right were also heroic figures. However flawed the idea of gradual progress might be, the example of the ideologies of the “low, dishonest decade” show it to have been a far lesser evil. Gray discussed another communist in a BBC broadcast and article earlier in 2011, though famous spy Kim Philby never renounced his faith in the ideology that caused him to betray his country. Gray brings up many of the same parallels and examples in regard to people’s abilities to harbor delusions about history and their place in it. Yesterday, incidentally, was Philby’s 100th birthday. In commemoration, a new book containing previously classified information on Philby’s espionage has been published, written by Russian journalist Nikolai Dolgopolov. The above link also contains an extract with a high-ranking former Soviet intelligence officer whose name still cannot be revealed. 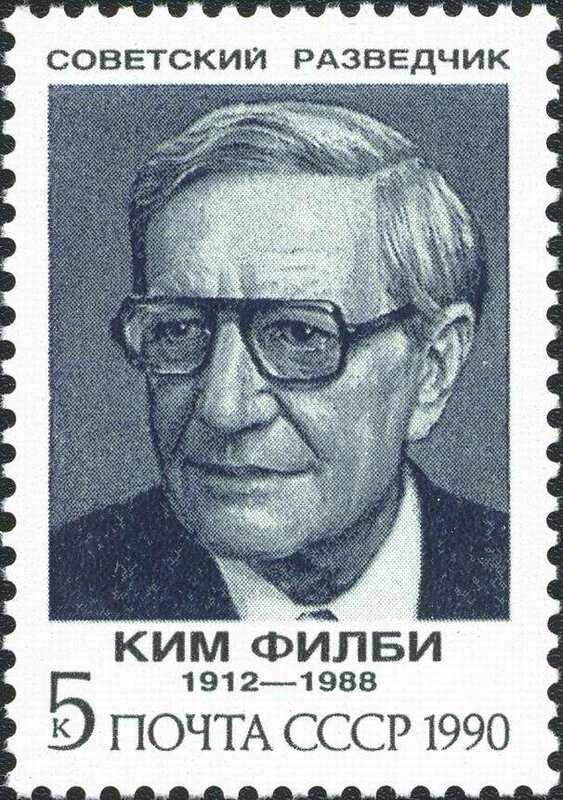 Feature photo – A 1990 Soviet stamp featuring Kim Philby referred to in an essay by the Russian poet Joseph Brodsky “Collector’s Item” in the book On Grief and Reason. (Uploaded to Wikimedia by Mariluna). I’m very interested in the whole Cambridge Spies story, so thanks for this. Didn’t know Philby got his mug on a stamp.